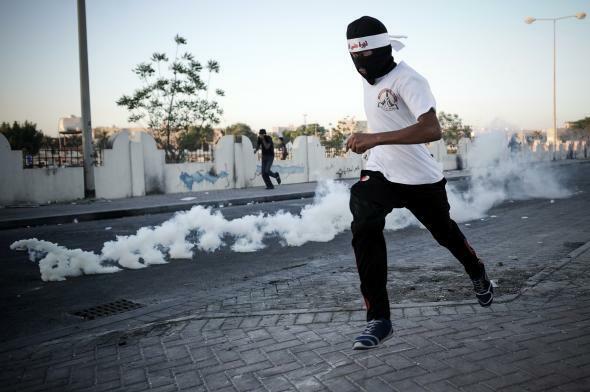 Bahrain ordering more than 1.6 million tear gas shells. A Bahraini protester runs from tear gas and birdshot fired by riot police during clashes following the funeral of Ali Khalil Sabbagh in the village of Bani Jamrah, west of Manama, on Oct. 23, 2013. The watchdog group Bahrain Watch has leaked a document from the country’s Interior Ministry that it says is a public tender for more than 1.6 million tear gas canisters, 90,000 tear gas grenades and 145,000 stun grenades. As the group points out, this is “more tear gas canisters than [Bahrain’s] entire population” of 1.3 million. Bahrain is estimated to have already used more than 2 million tear gas projectiles since 2011, or about 2,000 per day, many supplied by a company in South Korea.